For a long time I get such a message when playing some songs (especially the artist I have added in "favorites"). 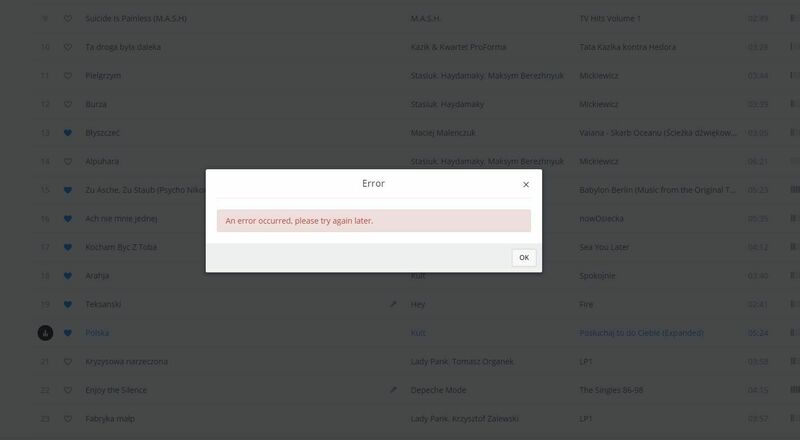 The error occurs both during playback on the phone (android) and laptop (application, website). Hi @Flo.Deezer. Funny thing... since yesterday everything is working like it should on all my devices (desktop & mobile). I've exactly the same problem. Especially with polish songs. Does this happen with the same songs all the time? If yes, could you please tell me which songs are affected? I know that you already tried this on both your devices. 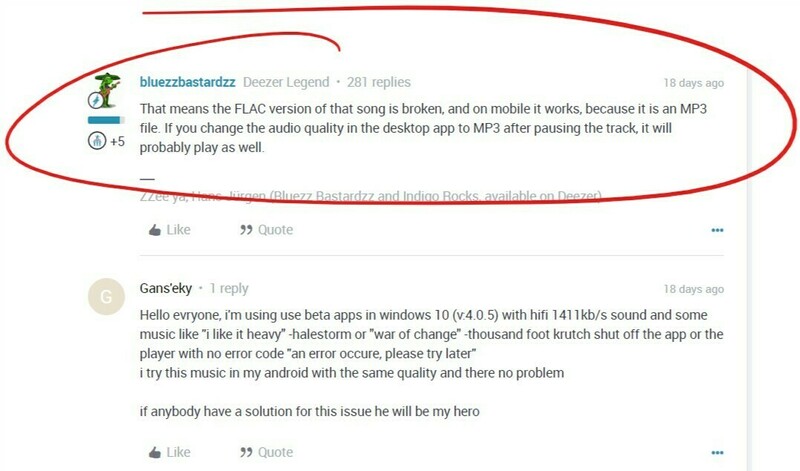 But perhaps clearing the cache can fix the issue (in case it doesn't happen to the same songs). @Rudi, yes, it happens with the same songs, for example this one: https://www.deezer.com/pl/track/375829791(Gdybym miał kogoś - Kazik & Kwartet ProForma). Clearing cache didn't help. Hi @mrgryzon @Mariusz.Makowski sorry about this. This is very unusual. Can you please give us a list of more songs this happens with? I was able to play the song on the website n Chrome though, can you try if that works for you? It is not on my android device, but my windows device. I only have one (ssd) disk. It also is with certain songs. Also when I don't download them. 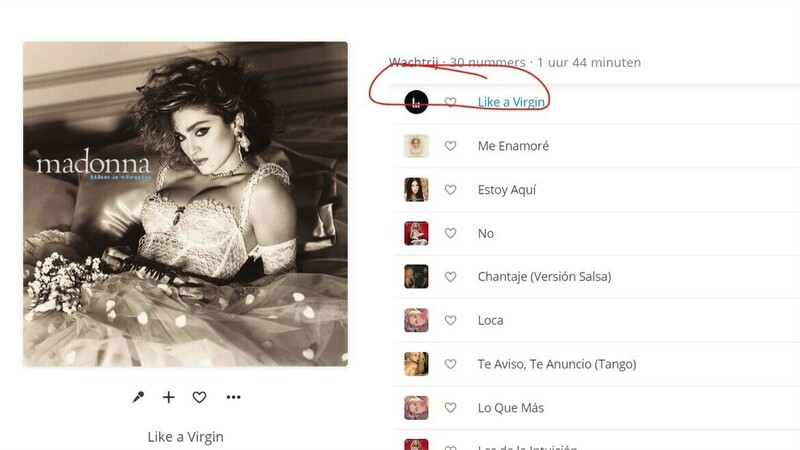 I always occures with the songs "Zoutelande" and "Like a virgin". 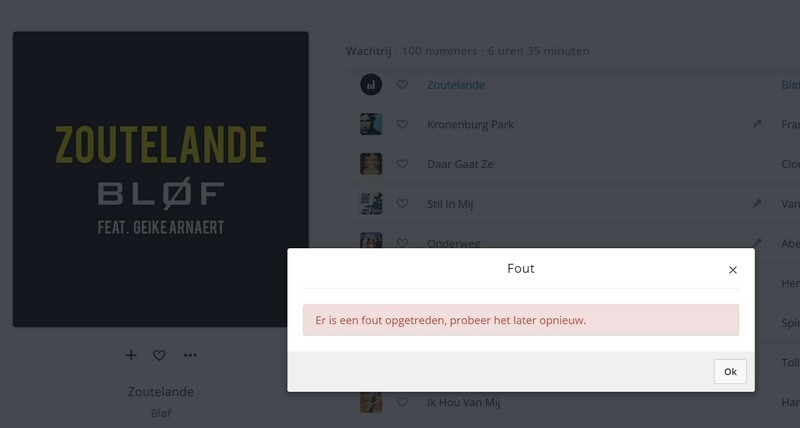 So when I choose a playlist, there are almost always a few songs, which gives an error. Doesn't matter on which windows device I play. It is just with the windows desktop app. Not with android app. What is the app and OS version you're on? Have you tried on a different internet connection? Sorry, no offence, but if you keep asking first line questions, the problem will never be solved. The fact that there is a topic, means that more people have the same problem. So it has to do someting with the app or maybe hifi modus. It would be nicer to get a good solution. Now it looks like you are stretching time, because you don't know the solution. But for now, I have this problem on different Windows 10 devices on different locations. Maybe this could be the issue. You should then check the flac versions of the songs. I appreciate what you're saying but before it gets passed to our devs for investigation, we need to make sure users follow basic troubleshooting - so that we can get to the bottom of the issue. Fortunately enough, you're experienced to go through those steps without my help - but not everyone is like you. Sometimes a couple of questions is all you need to sort things out. At the same time, if I'd asked them all in one go, some people may find it confusing. @iljafranken as @bluezzbastardzz and@Ielleke Franken pointed out, could you please try changing the audio quality to 'Better - 320kb/s' to see if the tracks play? This is very difficult to say. Every song is available on different albums, so there are more flacs from the same song. Besides it never ends, because many songs I didn's listen yet, probably have this problem. I had it with Zoutelande" and "Like a virgin. Also Footloose. Most of the "error" songs, I delete from my playlists, so I can play the playlist, without problems. But that shouldn't be the way. This one has it al the time, at the end of the song. When I change it to 320 mp3, it play's perfect. When I play HiFi it fails. I'll test the tracks with HiFi and will get back to you soon. I've tested 'Like a Virgin', 'Footloose' and 'Zoutelande' and was able to reproduce the issue, except on Footloose (may have played a different version than yours). I've now finished a report to our devs so that they can investigate the problem. If you find more tracks like these, please let me know. I'll be back here once I get an update! I have the 30 day trial and downloaded the desktop app on windows 10 PC. I thought it would be a step up from Google Play which I've had for some time. Periodically during playing however, I get an error message which, from a software developers point of view, is the most frustrating pointless error message.... "An Error Occurred, Please Try Again Later". Not even a hint? Really? I will use the desktop app primarily so this will likely be a deal breaker and I'll stick with Google Play. Any ideas? I see in the forum others have had this same issue. Sorry about that - I can see that you're a Deezer HiFi subscriber. This issue has been worked on and we'll get back here once there's an update. In the meantime could you please tell me which tracks are affected? If you could send me links, that'd be really appreciated.